U.S. President Donald Trump Thursday claimed he had made victories over burden sharing and defense spending during the summit of the North Atlantic Treaty Organization (NATO), though reports from inside the NATO headquarters in Brussels suggested chaos and turmoil. Before leaving on Thursday for a visit to the United Kingdom, Trump called U.S. commitment to the alliance "very strong," and referred to the two-day summit as "fantastic" characterized by "a great collegial spirit". "NATO is much stronger now than it was two days ago," President Trump said. He claimed in a press conference that "Yesterday I let allies know I was extremely unhappy with what was happening." On Thursday, the American president was reported to have arrived late at a closed session Thursday morning, on the second day of the summit, and disrupted talks with the Presidents of Ukraine and Georgia regarding the accession of their nations to NATO, in order to slam allies on defense spending shortfalls. The Ukranian and Georgian leaders were asked to leave, since burden sharing is a purely internal NATO issue. Trump is reported to have spoken of "grave consequences" if allies did not meet their 2 percent of GDP defense spending targets, saying that the United States could "go our own way" if his demands were not met. French President Emmanuel Macron, along with other leaders and officials, denied to reporters that the U.S. president had threatened to quit the defense organization, saying, "President Trump never at any moment, either in public or private, threatened to withdraw from NATO." At a later press conference, Trump did not deny that he had made the threat, and said he had the authority to take the U.S. out of NATO without Congress approval but that it was "unnecessary." The U.S. president's shake-up of the NATO summit had begun Wednesday at a working breakfast with NATO Secretary General Jens Stoltenberg, when Trump accused Germany of being controlled by Russian interests. "Germany is totally controlled by Russia because they will be getting 60-70 percent of their energy from Russia and a new pipeline," Trump said to reporters Wednesday morning, calling the alleged dependence on Russian energy "inappropriate." EU figures show Russia may be responsible for between 50 percent and 75 percent of Germany's gas imports, but gas makes up less than 20 percent of Germany's power production mix. German Chancellor Angela Merkel denied the claims, but had a harder time fending off Trump's criticism that Germany and many other allies were not meeting defense spending targets of 2 percent of GDP. According to NATO figures, only five of 29 allies met their defense spending targets this year: Estonia, Greece, Latvia, the UK and the U.S.
Trump told reporters that allies had agreed to meet defense spending figures faster than previously planned, and said that financial commitments would increase in the future. He urged allies on Wednesday to double their defense spending targets to 4 percent of GDP. French President Macron denied that further commitments had been made, telling reporters that a "very detailed" statement had been released the day prior: "It confirms the goal of 2 percent by 2024. That's all." Angela Merkel did not address the U.S. President's comments directly when she spoke to reporters before leaving Brussels, but made her position clear that Germany had already been increasing its commitment to NATO. "We had a fundamental discussion with all the NATO members because of the question that arose this morning - what do we have to do to improve our defense," Merkel said. "I made the point for Germany that we know we have to do more. But also, that we are doing this already since many years. The turnaround happened." President Trump has arrived in the United Kingdom for a much-anticipated visit that is expected to draw large protests. He is also scheduled to hold his first summit with Russian President Vladimir Putin in Helsinki, Finland, on July 16, 2018. 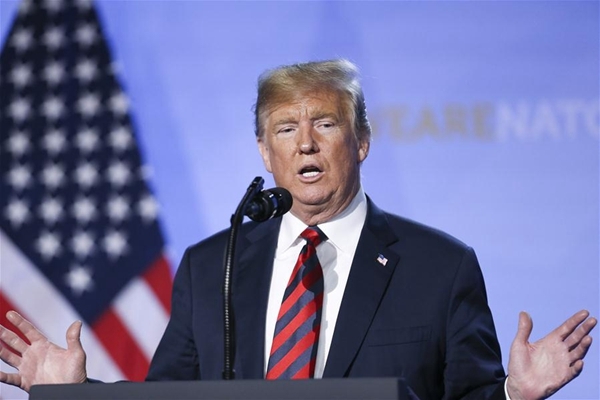 U.S. President Donald Trump Thursday claimed he had made victories over burden sharing and defense spending during the NATO summit.